10 February 2017, at 6:00a.m. US - US pork and beef exports wrapped up an excellent 2016 performance with very strong December results, according to statistics released by USDA and compiled by USMEF. 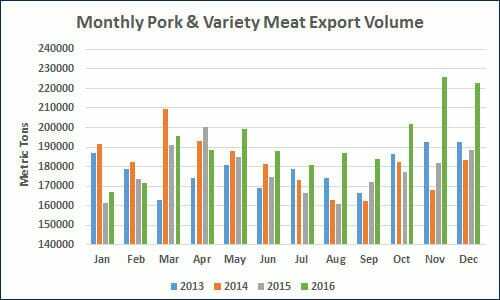 Pork export volume reached a record 2.31 million metric tons (mt) in 2016, up 8 per cent year-over-year and 2 per cent above the previous high in 2012. Export value increased 7 per cent from a year ago to $5.94 billion. December pork exports totaled 222,635 mt, up 18 per cent year-over-year, valued at $564.2 million, up 20 per cent. Exports accounted for 25.8 per cent of total 2016 pork production and 21.5 per cent for muscle cuts – up from 24.2 per cent and 20.8 per cent, respectively, in 2015. December ratios were 28 per cent for total production and 23 per cent for muscle cuts only – up significantly from December 2015. Export value per head slaughtered averaged $50.20 in 2016, up 4 per cent from the previous year. The December average was $56.06, up 24 per cent. A remarkable second half pushed 2016 pork export volume to Mexico to its fifth consecutive record at 730,316 mt – breaking the previous record by 2 per cent. Export value to Mexico totaled $1.36 billion, up 7 per cent year-over-year and the second-highest on record, trailing only the $1.56 billion mark reached in 2014. Though down from the high levels seen earlier in the year, December pork exports to China/Hong Kong were still up 40 per cent year-over-year in volume (47,242 mt) and 42 per cent higher in value ($96 million). For the full year, exports to China/Hong set a new volume record of 544,943 mt (up 61 per cent) and broke the $1 billion mark for the first time ($1.07 billion, up 53 per cent). Japan remained the leading value destination for US pork, though exports fell 5 per cent in volume (387,712 mt) and 2 per cent in value ($1.56 billion) compared to 2015. However, chilled exports to Japan set a new record of 218,211 mt, up 8 per cent. Led by a record performance in Central America and a fourth-quarter surge in Colombia and Chile, exports to the Central/South America region increased 11 per cent in volume (135,954 mt) and 9 per cent in value ($334.5 million). Pork shipments increased to both Australia and New Zealand, as export volume to Oceania reached 69,963 mt (up 10 per cent) valued at $197.3 million (up 3 per cent). Exports to the Dominican Republic set another record in 2016, topping the previous year’s totals by 10 per cent in volume (25,591 mt) and 6 per cent in value ($56.4 million). Fueled by increases in China/Hong Kong and Canada and steady exports to Mexico, pork variety meat exports jumped 20 per cent in volume to 523,199 mt and 24 per cent in value to $999 million – just short of the record levels reached in 2014. Researchers Fiona Rioja-Lang, Jennifer Brown, Egan Brockhoff, and Luigi Faucitano review the latest literature on the factors influencing swine welfare during transport in Canada.